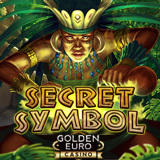 The new Secret Symbol slot from Realtime Gaming, now available at Golden Euro Casino, is a lush hi rez, wide screen game with great bonus features to help boost winnings. Secret Symbol is an Aztec-themed game with a free spins feature where wins are multiplied up to 20X. Until the end of the month you can get a special secret bonus to try it. New Aztec-themed slot from RTG has free spins feature with up to 20X multipliers. Exotic jungle animals and amazing treasures of the Aztecs spin on Secret Symbol’s five reels. Its Wild symbol is a mighty Aztec Chief that can expand to cover its entire reel and create morer winning combinations. Three scatter symbols (an Aztec pyramid) launch free spins where wins are multiplied from 2X to 20X. Golden Euro has always catered to players using Euros, but it now also accepts Bitcoins. Until the end of this month, players making a Bitcoin deposit will get free spins on the Nova 7s slot game. Bitcoin banking information.